Thank you for visiting Perdido Title & Abstract, Inc. 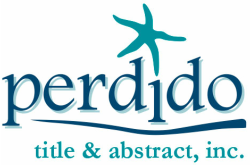 When it comes to checking Property titles, Perdido Title & Abstract is here to assist you. We offer a wide variety of residential searches for owners, lenders and attorney firms. We offer a variety of services for owners, developers, lenders and attorney firms. ​© 2018 Perdido Title & Abstract Inc.